2If your dough is coming straight from the fridge, let it sit on the countertop for about 10 minutes, until it’s malleable. Divide the pastry in half, making one piece just slightly larger than the other. 3On a lightly floured surface, roll the bigger piece of pastry out into a 12-inch circle. Gently fold the dough into quarters to transfer it into a pie plate. Unfold the dough onto the plate, center it, and gently fit the dough into the plate without stretching it, leaving the edges hanging over. 4To peel the peaches, drop them into a large pot of boiling water for about 30 seconds; remove them with a slotted spoon and plunge them into cold water. The skins should slip right off. Slice them thickly into a large bowl, removing the pits. 5In a small bowl, stir together the sugar, flour, cinnamon, and nutmeg. Sprinkle over the peaches and toss gently to coat them with the flour mixture. Pour the peaches into the crust, mounding them in the middle. 6On a lightly floured surface, roll out the second piece of pastry into about a 12 inch circle. Lay it over the peaches and press around the edges to seal. 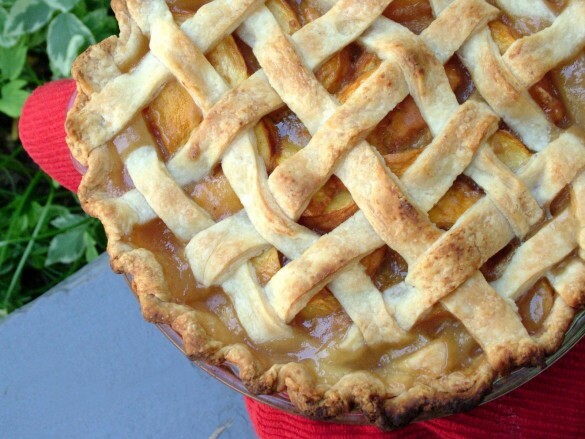 Trim both layers of excess pastry with scissors or a knife so that the overhang is about 1/2-inch around the pie plate. Tuck the edges of the pastry under itself so that it is even with the edge of the pie plate, and flute it all around the edge with your fingers. Cut a few slits in the top crust to allow steam to escape as the pie bakes. 7Or, for a lattice crust: cut the circle of dough into strips and lay half of them over the pie; fold back every second strip and lay another strip across it, put the folded-over ones back and alternate folding over the ones that the cross-strip needs to go under. (You'll figure it out - just weave a lattice! It doesn't have to be perfect.) Press the lattice ends onto the edge of the bottom pastry, trim it all around and crimp it with your finger or a fork. 8Bake for an hour or so (you might need an extra 10 minutes), until the pie is golden and the juices are bubbling through the slits. If the pastry is browning too quickly, cover it loosely with a piece of foil or cut a ring of foil as described above. Serve warm, at room temperature, or cold.